I am assuming it is due to all of the liability issues, but have you noticed how few pools these days have a diving board? 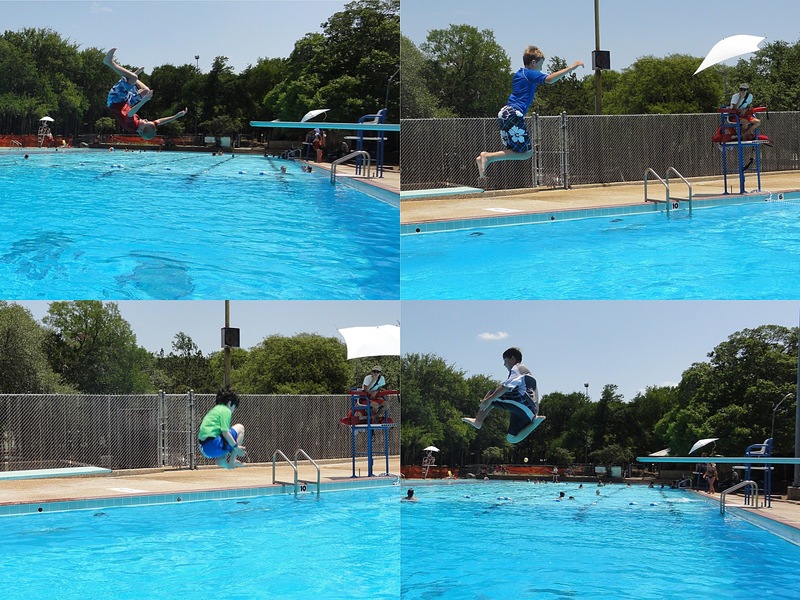 In fact, the only other place that we have been with a diving board was at Barton Springs (where the water is so cold, only the truly brave venture out the board!) So, when Dave told me he passed a pool in South Austin with a diving board, I quickly added it to my list of top 50. We went there today with some friends, and it was awesome. The boys dove off the board, swam to the ladder, climbed out and did it all over again... for three hours straight! They did cannon balls, can openers, belly flops, karate chops and more. I had an amazing time just watching - though I couldn't resist taking a few dives myself :o) In addition, this pool is olympic sized, so I got in a couple of long laps while they swam. Loads of fun!